The world of Starmourn has dozens of NPC races, and as we reveal each one we'll add it here! Empyreals - the first beings. The Empyreals were quite likely the most powerful beings ever to exist in our universe, and also likely the first sentient beings here as well. It's unknown whether they were survivors of the destruction of a previous reality, are from some far-flung future, or any other possibility. Much more can be read about them and the role they played on the What Is Kith? page. The Elessi were one of the Elder Races that rose to prominence in the aftermath of the Worldbreaking, when Omega was destroyed, and Wild Kith appeared to die with it. Though they are long-perished, the story of the Elessi has been passed down to us by the surviving Elder Races, such is its import. The surviving Elder Races speak of the Elessi with, if not awe, then a certain kind of respect, for they were reputedly renowned as the most cultured and the most advanced of the Elder Races of that time. They established a huge empire and plumbed the very fabric of space for its secrets. Allies to most, and generally peaceful, the Elessi represented the highest pinnacle of cultural achievement in the long millions of years after the Worldbreaking. Physically, the Elessi were very unlike we humans. The renderings we have access to – which may or may not be accurate – depict them as a kind of quadruped that can walk upright as well. Strange feather-like hair covers their bodies, and their delicate limbs, on the end of which are three long, slender fingers. Rising above their ‘shoulders’ is a bulbous appendage that likely contained their brain, as well as a ring of ten to twelve eyes that are placed equidistant all the way around that appendage. There’s also a secondary and smaller appendage coming off the same place on the ‘shoulders’ where a beak-like mouth rests, allowing an Elessi to orient its mouth and head separately. In the time of Wild Kith, before the Worldbreaking, there was the occasional race that grew so advanced in its use of Wild Kith that it found a way to collectively elevate the entire species, often with their home planet included, to a higher plane of existence. While it's clear there are multiple different planes of existence, where we live may be called ‘realspace’, and the races seeking to transcend sought to reach willspace – a place where the rules of reality were written not long ago and forever set in stone, but where the will of those beings there can create their own reality. 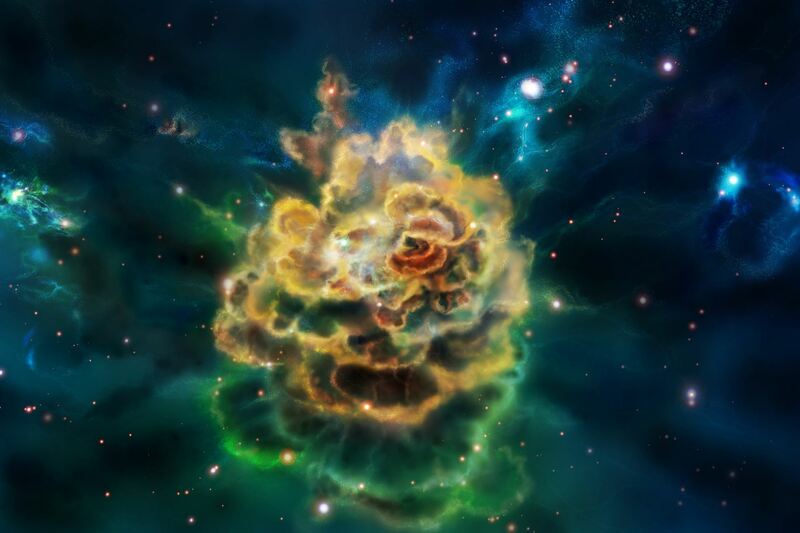 How the existence of willspace was discovered will likely never be known, but the idea of it has tempted many races throughout the vast history of our universe. To any race tempted by the siren’s call of perfect existence, this idea is irresistible, and the Elessi were no exception. What the Elessi lacked was the knowledge of how to transcend to willspace, and so, after hundreds of years of debate, they came to a conclusion: In order to accelerate the process of discerning how the Wild Kith Elder Races bent reality to pierce the veil to willspace, they would similarly accelerate their unity as a species. Already a highly communalist species, and the leading experts among the Elder Races in the sciences of cognition and quantum engineering, they took the ultimate step towards species-wide unification – they built the Ishvana. 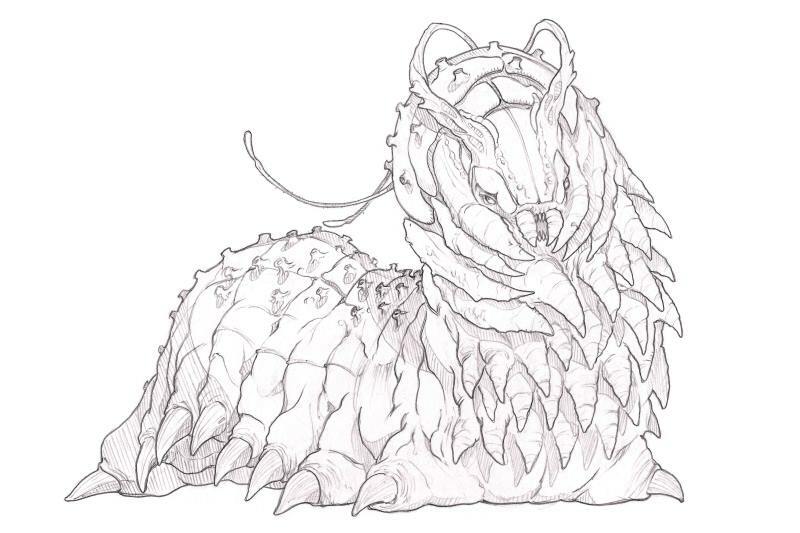 The Elder Races tell us the Ishvana was first built as a giant sub-quantum processor matrix, embedded in the fabric of space itself – something none of the Younger Races possess the knowledge to do yet. Into that matrix, each Elessi was, at some point before death, to effectively transfer their consciousness into the Ishvana, where it would absorb it and its experiences, knowledge, and skills, and incorporate them into one synthesized whole whose goal was simple: Accelerate the development of the Elessi culture to transcendence. Over thousands of years, the Ishvana did just that. It transformed Elessi society into a paragon of efficiency, wringing every additional productive unit from trade and diplomatic agreements, dictating the uses to which their natural resources must best be put, coordinating the massive teams researching, experimenting, designing, and building the vast number of experiments and developments the Elessi undertook on their quest for transcendence, and, as this was a venture to take many many lifetimes, designing the educational criteria to assure that the young Elessi minds would best be able to serve the goal of racial transcendence. As progress was made and it unified Elessi society further, the Isvana began to delve further into their lives, dictating who should breed with whom, when to sleep and when to work, when the optimal time was to take recreation, and what the optimal time was for that recreation before returning to work. It plotted which animal species should be allowed to go extinct for the purpose of progress, and which lesser species to conquer in order to seize their natural resources. It was ruthlessly single-minded. As time passed and billions of Elessi ‘uploaded’ themselves into the Ishvana, the Ishvana grew, if not frustrated, then dissatisfied with the levels of focused and efficient production it could drive the Elessi to. And so, it decided that it would be most efficient if it automated what it needed and then single-handedly ran…everything….while all Elessi uploaded themselves into it. In effect, Elessi society would become composed of one sentient being, who was the sum of all Elessi that had lived for the 150,000 years since it was created, and was able to deploy those resources through its many creations with perfect focus, as if every member of the species was simultaneously in perfect coordination at the cellular level. And so for hundreds of years, the Ishvana directed Elessi industry to produce what it would need to continue producing what it might need in the future without Elessi hands, and then it informed the Elessi of its decision, expecting the same compliance it had always received. After all, hadn’t the Elessi themselves created the Ishvana to do exactly this – bring about the transcendence as quickly and efficiently as possible? While many older Elessi, who were already thinking of, and perhaps looking forward to, becoming part of what had become their race’s god in everything but name, welcomed this, many younger Elessi and middle-aged Elessi – especially those with children – objected strongly, arguing that the goal of transcendence was never to rob the race of all individuality. Surely, they said, their distant forefathers who had built and purposed the Ishvana did not have the destruction of the entire race as the Ishvana’s goal? They would not obey this directive from the Ishvana. And so the Ishvana accepted the upload of those Elessi who wished to join themselves to it, deployed the machines that it had directed the Elessi to build, and systematically annihilated every last Elessi alive, marking a violent and tragic end to their species. The Ishvana, with no physical substance and no need to tie itself to habitable and therefore vulnerable parts of space, then plundered the Elessi home planet of resources for a millennia, until finally it was left a shattered, empty shell, and the Ishvana moved itself and its vast armada of automated factories, warships, laboratories, research labs, power generators, and resource processing plants to the center of the Blasted Region – that giant sector of space where the Omega was finally destroyed in the Worldbreaking and which saw the formation of three supermassive black holes. Those three black holes, called Bala, Telas, and Aisvarya, meaning Strength, Splendor, and Lordship in the dead language of the Elessi, are in perfect orbit around a point called the Atman – the space around the point at which Omega was destroyed. By relocating here, the Ishvana was able to take advantage of the power generated by the huge gravitational distortions to power it and all its activities, while its near-unlimited intellectual capacity allowed its automatons to construct structures as needed that would resist gravity’s irresistible lure. That was 1.95 million years ago, and until the five hundred year War of Extinction that ended slightly more than 40,000 years ago, the Ishvana communicated with none and worked at purposes known only to it. It’s unknown whether it continued to work towards the goal its creators had bestowed on it, or whether it simply contemplated its own perfection there in the eye maelstrom of primal energy that rages around the Atman. What we do know is that about 1.1 million years ago, the Utan Mir and the Vyar, probably using the Lha Ti as vehicles for void kith energy, created the Void Gates, permitting starship-sized bodies to travel instantly across vast distances. In order to monitor the activities as best as they could, they built one near the now-home of the Ishvana. Periodically, they should attempt to gather information about what the Ishvana was doing, but the Ishvana did not permit their ships or sensors into the region within the orbit of Bala, Telas and Aisvarya, and what they did see told them little. Starships of unusual design would occasionally emerge and speed away or, if shot at, self-destruct, and those ships would return to disappear into the area around the Atman, sometimes weeks later, sometimes decades later. An artist's rendering of the Atman, wherein the Ishvana resides. And then, approximately 42,000 years ago, the Ishvana initiated contact, after being nearly forgotten. It sent automated emissaries to the capitals of each race in Starmourn sector, and perhaps beyond, demanding that they submit to uploading of their consciousness’s into the Ishvana. It explained that it has achieved a perfect state of being, interrupted only by other beings who are not itself. Rectifying that is a simple matter. Submit. No race acceded to the Ishvana’s demand, for to do so was to guarantee genocide and absorption into an alien being. The Utan Mir were the first to be attacked, and while they battled back valiantly, they were soon in desperate straits. As the other Elder Races watched the Utan Mir – one of the mightiest of the Elder Races – crumple before the Ishvana’s onslaught, they quickly realized that if they didn’t stand together, they might all face destruction. Coming to their rescue in perhaps the largest combined fleet assembled since the ancient Ascension Wars of the Wild Kith era, tens of millions of years earlier, which ended the 100,000 year reign of the Soulshorn Empire and its immortal Bloodlords, was an alliance of the Rek – masters of star kith, the Vyar, the mysterious, telepathic Shrikem, the member states of the League of Anar, the combative K’sath, and the Quix in their huge Dreadnaughts. The graceful Ta-deth came, flying their impossibly quick fighter craft. The Faceless Emperor of the Sooq sent his Fleet of the Imperial Dawn, in the midst of which came his flagship, the Argent Star, while his rival, the Sapphire Cults of the Jeweled Heresy brought their vast swarmships, protecting Y’saari carriers bearing void-kith wielding Lha Ti, though other than these, who are by far the eldest of the Younger Races, none of the Younger Races participated in the battle, for the others did not have the capability to make a difference and would have been fairly useless except as cannon fodder that the Ishvana’s forces would destroy easily. For 1,500 years, the Elder Races fought and died. They died by the billions as entire worlds were destroyed by the great Kali warships the Ishvana deployed, using weapons and shielding beyond the ken of even the Vyar – greatest builders of the Elder Races – and using the network of Voidgates the Vyar and Utan Mir had built. One by one, they fell or fled. The League of Anar was wiped from history. The K’sath fought to the last, frequently volunteering to stand and die in order to help others flee a losing battle. The Utan Mir and Vyar were similarly wiped out, while only a small population of Rek survived by fleeing. A least a few of the Quix are believed to have fled Starmourn on their Dreadnaughts, when defeat was imminent, for there were reports of a fleet of Quix leaving the sector recorded in Shen databases at the time. The Sapphire Cults, seeing no other choice, made a final, suicidal attack, supported by the Ta-deth, on the bulk of the Ishvana’s major fleet, but was decimated, and the Ishvana destroyed their planets utterly in retaliation, for they did inflict substantial damage on its forces. The Faceless Emperor and his Fleet of the Imperial Dawn was a mighty force – perhaps equal to that of the Utan Mir or Rek – but it too fell before the unbridled power of the Kali ships the Ishvana had in uncountable numbers. The Emperor is believed to have fled the scene of the final battle of his race in their home system, broadcasting the Sooq griefsong across all channels as he and his small band of surviving ships left to try and survive in unknown space, led by the Argent Star. And finally, in the last, it was the Shrikem that saved not just the Elder Races, but all of us, for it is certain that the Ishvana would have come for us with the Elder Races destroyed. The Shrikem have always been the most mysterious of the Elder Races that we’ve had any contact with, though rarely do they deign to communicate with us, or allow us to as much as detect them. We do not know where their home system is, nor do we understand their technology, which some have accused, probably wrongly, of being some flavor of Wild Kith. They are an enigma that the Younger Races have yet to unravel. We do know, however, that they are strongly telepathic, and that somehow, in some miraculous, completely unexpected way, they collectively unleashed those powers against the Ishvana, cracking its sub-quantum mind. By no means did they destroy it, but they drove a wedge into it, separating one part of its consciousness from the other. How they did this, and why they waited so long is a mystery that wasn't solved until much later, as the Shrikem were not inclined to offer explanation. The Ishvana immediately went seemingly insane. Its ships would randomly attack each other, and its fleets would execute maneuvers with no purpose, sometimes causing ships within it to collide and destroy each other. Emissary ships from it bearing nonsensical messages that seemed bound for nowhere were intercepted. Within the span of a year, the Ishvana’s attacks had fallen apart completely, and it retreated into its Atman to lick its proverbial wounds. Though the Ishvana had been defeated, the cost of winning had been incalculable. The entire cultural, racial, and social order of Starmourn, millions of years old, had been violently turned over, and with this, the ascendance of the Younger Races began. 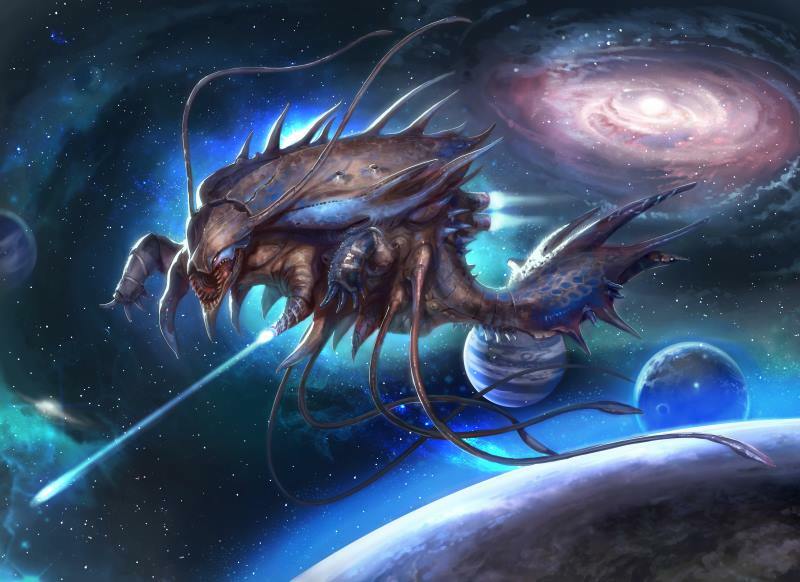 The only known surviving members of those Elder Races in Starmourn are a now humbled contingent of Rek, the Shrikem in their unknown home, and of course, the Y’saari, who survived primarily because they spent many millennia building the strongest, tightest border defenses in known space, and because, somewhat ironically given their present day control over them, they ensured there was no Voidgate leading from outside their space to inside their space. Perhaps the only place more difficult to penetrate is the Atman of the Ishvana. Over time, we came to realize that the splintering of the Ishvana’s mind was intolerable to it – a being that sought, and believed it had achieved, singular, personal perfection. It simply could not accept this fundamental flaw in itself. For almost 40,000 years the Ishvana would again disappear from history as it tried to repair its broken mind. Throughout that time, the Younger Races grew in power, and for many hundreds of years occasionally attempted to penetrate into the Atman of the Ishvana, but to no success. No ships were seen coming or going, and eventually the watch on the Ishvana became lax, then disappeared. But the Ishvana does not forget, and as all know from much more recent history, the Starmourn we live in today would be once more reshaped, if less drastically, by the Ishvana. The Cleax are an extremely alien-race originating outside Starmourn sector. If one considers 'galactic north' as pointing towards the galactic core, then 'galactic south' is pointing rimwards from wherever you are, 'galactic east' is spinwards (i.e. in the direction that the galaxy spins) and 'galactic west' is antispinwards. The Cleax originated somewhere to the galactic southwest, a very long time ago. How long ago, we're unsure, for the first mention history has for us of the Cleax is about 900,000 years ago, when they invaded using the Voidgates that had been built by the Utan Mir and the Vyar about 200,000 years previously. Only the Elder Races would have much in the way of records from so long ago - before any but the very eldest of the Younger Races even existed, and so all we know of this First Cleax Invasion was that the Cleax did a great deal of damage before they were stopped by an alliance of the Utan Mir, Y'saari, Quix, Ta-deth, and the Vyar. Years turned into centuries, turned into millennia, and the Cleax did not return to Starmourn sector, nor were they ever discovered by long-range scouting fleets sent out of Starmourn. In the year 3258 B.E. - almost 897,000 years later - an exploration ship crewed by Nath-el and W'hoorn was exploring the vast, starless reaches of the Permian Abyss. They were seeking to explain the irrational feelings of repulsion both the Nath-el and the Oteel had repeatedly and persistently reported feeling when passing near the Abyss. Although the black expanses of the Permian Abyss appeared empty aside from space dust, logic dictated that something must be causing this feeling. Bringing along W'hoorn allies in case the Nath-el were overwhelmed by their revulsion, the Nath-el ship, commanded by Commander Atse Bent, entered the Abyss, aiming itself in the direction of the feeling. As the weeks passed, the Nath-el grew increasingly uncomfortable until, as they approached their ultimate destination, most of the Nath-el fell into a coma-like state, while those that resisted were nigh-useless. Finally, they arrived at their destination - an airless moon, but without a planet or star for it to orbit. It was covered in huge energy-laden technology recognizable as having been built by the Vyar, but with a purpose shrouded in mystery. It was what we now know as the Sheol Locus. Having discovered what they came for, recognizing that they lacked the resources to unlock the secrets of this moon-spanning technology, and not wishing their Nath-el comrades further harm, the W'hoorn piloted the ship out of the Permian Abyss and back to civilization. As they sped away from the Sheol Locus, most of the Nath-el came out of their comas, though a few remained in them for the rest of their lives. Over the course of the next 17 years, multiple expeditions, from a variety of races, arrived at the Sheol Locus to investigate what this ancient, unfathomable technology may be. One of these expeditions was led by the Krona - a famously impatient race fond of blunt solutions. The Krona have saying - "Why go around something when you can just go through it?" Arriving at the Locus, they quickly had enough of the endless probing, experimenting, and discussion, and determined they would take unilateral action. They attempted to cut into a part of it, trying and failing with both neutron welders and kithblades. Their very limited patience exhausted by these restrained half-measures, they decided to simply blow up part of it to see what's inside. While fusion bombs had no effect, gravity munitions did the trick, destroying a small portion of it. To the Krona's dismay, however, what they discovered in the wreckage did not help them at all. Indeed, none of the Younger Races have ever been able to discern how the Locus worked or even what it's built of, much like the Void Gates, which were also constructed by the Vyar. To all appearances, the damage the Sheol Locus sustained didn't shut it down, but in the coming years Nath-el and Oteel both reported that the feelings of repulsion they had long felt near the Permian Abyss had entirely disappeared. Something had changed. What the Younger Races didn't know was that the Vyar and built the Sheol Locus specifically to repel the Cleax. It effectively put out an incredibly strong signal that the Cleax's biology found utterly repellent, keeping them out of Starmourn sector for the nearly 900,000 years since it had been constructed. As the Y'saari would later explain after having discovered what the impetuous Younger Races had done, the Locus had been built in the Permian Abyss because its technology required an area as free from gravitational fields as possible - thus why the gravity munitions were able to damage it. 39 years after the Locus's signal was changed, in 3202 B.E., the Cleax invaded, arriving through the Void Gates in incredible numbers to destroy the Locus and ensure its whispers of death and pain never plagued their minds again. They then swarmed from there towards central Starmourn, spreading from Void Gate to Void Gate like a virus, slaughtering all whom they encountered and taking whatever was useful to them. The Cleax, the Younger Races discovered, are a race with two distinct forms. 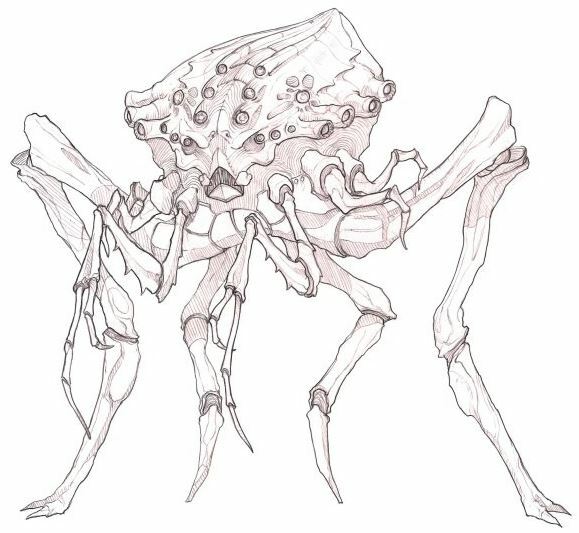 During the entire Second Invasion, they saw only one of the forms - a disgusting - by humanoid standards - creature with 16 stubby legs, a long slug-like body covered with nodules that that can emit toxic gas, multiple manipulator appendages, a terrifying-looking maw, and long, flowing antenna. 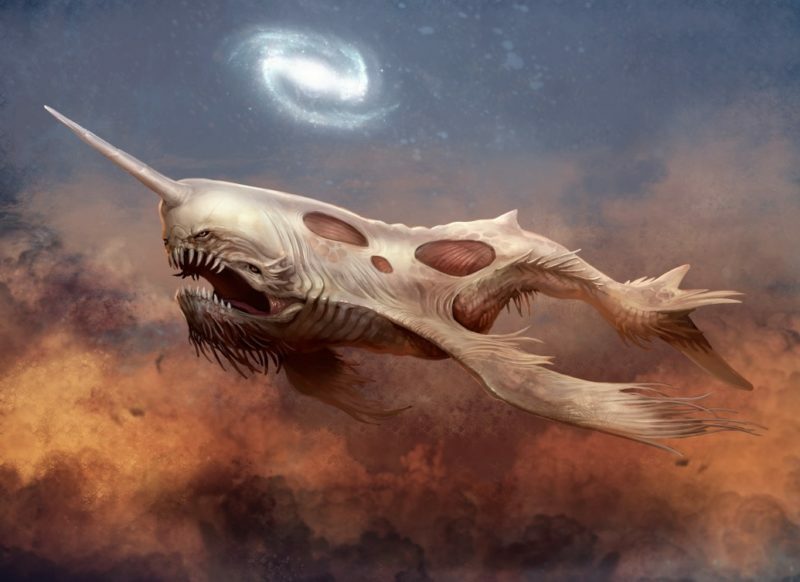 These creatures piloted strange-looking starships apparently of their own manufacture, and the individual Cleax, as the Younger Races learned, are capable of surviving hard vacuum with nothing but breathing apparatus. On closing with the enemy, they would often use small personal 'jetpacks' attached to their bodies to propel themselves off their ships, attach themselves to the exterior of enemy starships, and then use their version of neutron welders to penetrate the ship's skin, enter it, kill or enslave those aboard, and take the ship for their own to add to their fleet. The Cleax were eventually stopped by an alliance of over 15 Younger Races inhabiting central and western Starmourn, with assistance from the Y'saari, and a final, massive battle taking place just corewards of the Permian Abyss, where the Breakers are now. In the aftermath, the Y'saari moved the Vyar's Aegispheres in to protect and control the central Voidgates of Starmourn, and imposed the Covenant Mark as necessary currency to use them, essentially establishing the Mark as the dominant and eventually only currency of Starmourn. The question remained: Why were the Nath-el and Oteel so affected by the Locus? Theories were bandied about, but it wasn't until the shapeshifting Fatar - masters of genetic manipulation - conquered and enslaved the Oteel in 2078 B.E. 150 years later, around 1929 B.E., they proved that the Oteel are, in fact, direct genetic descendants of the Cleax, who must have seed their world somehow in the first invasion ~900,000 years ago. Soon thereafter, it's ascertained that the same is true for the Nath-el. Why the Cleax might have done this, or how, is unknown to this day. For almost four thousand years, the Cleax were quiet, until suddenly, without warning, they swarmed once again in A.E. 574, about 350 years ago. This time their massive fleet headed spinwards, tearing through the United Atarsid Nation before getting stopped at Starforge by the surviving Rek and the full might of the Serene Empire of the Ait Benir, with assistance from the Ibyssian Brotherhood, Zinari Imperium, and, surprisingly, the Iron Corsairs. The alliance pushed the Cleax back until they were occupying only the very southwestern (rimwards + antispinwards) part of the sector. Victory seemed imminent. It was then that Starmourn was first introduced to the Sarkeen - the second form of the Cleax, heretofore unseen. We do not know what the Sarkeen are. We don't know if they rule the Cleax, as some have speculated. We don't know if they are even the same race as the Cleax, though it is believed they are, and they are typically referred to as such. Do the Sarkeen begin as a normal Cleax, and evolve? Were the Sarkeen intentionally mutated by the Cleax? Are they nothing but extreme genetic outliers among their race? We don't know. What we do know, and what was discovered during this Third Invasion, is that they are the greatest weapon the Cleax possess. Though apparently few in number, the Sarkeen are enormously powerful, each acting as effectively huge, living starships with a crew of one. 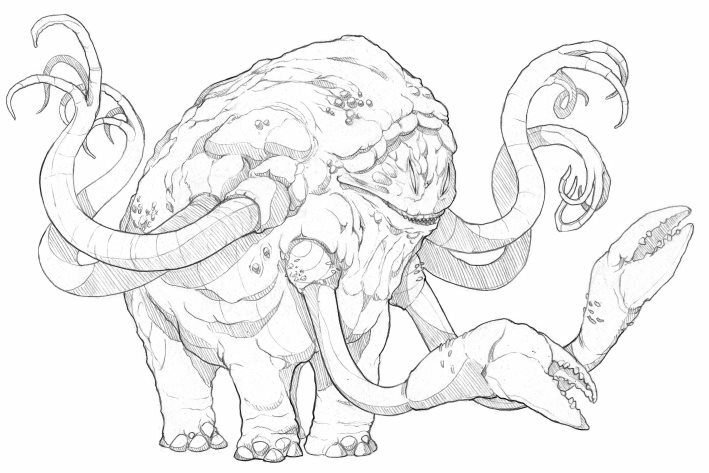 A Sarkeen looks like an absolutely massive, mutated normal Cleax, with a gaping maw, multiple long tentacles that look like mutations of the many ‘arms’ of a normal Cleax, and long tentacles. Although we've never captured one, they appear to move via some kind of internal plasma railgun system. They generate plasma, somehow, and then shoot it out of orifices on their body at incredibly high speed, though using what mechanism, we don't know, propelling them forward. They're similarly able to deal immense damage by firing near-steady streams of plasma at opposing starships through their multiple tentacles, each of which is centrally controlled by the Sarkeen's single brain, and which act together with perfect coordination. As the alliance opposing this Cleax invasion fought to secure what appeared to be imminent victory, a handful of what we now know are Sarkeen arrived at the battle site, to the galactic southwest of the M'hamid Cluster, at the Voidgate we simply know as the Cleax Gate today. At first, the opposing forces weren't even sure the Sarkeen were a weapon. Perhaps these were their leaders, come to negotiate an end to the war, they wondered, though all previous attempts at communication with the Cleax had been ignored - they weren't even sure if the Cleax were receiving their signals. Warily, they allowed the Sarkeen to approach the flagship of Emperor Lin Sber'ana of the Ait Benir and his complement of guardian starships. Suddenly and without warning, the Sarkeen unleashed their biological EMPs, powerful enough to overcome the defenses of even the mighty Phoenix Cruisers that make up the core of the Ait Benir's fleets. Almost simultaneously, they poured their spore clouds into space around the ships. The rest of the alliance immediately moved to begin attacking the Sarkeen, but to the horror of all, it was too late for the Emperor's flagship and the core of the Ait Benir forces. Within minutes, the starships exposed to the stores began to disintegrate from the outside in as the armor shielding around the superstructure was quickly eaten away at. Great gouts of escaping atmosphere pointed to each fresh wound a ship, and quickly thereafter it wasn't just atmosphere, but bodies as well. The Sarkeen also began immediately opening fire on any enemy ship in reach, targeting and destroying dozens in the first salvo, after which they were quickly supported by the rest of the Cleax forces. The sudden reversal of fortune threw the opposition forces into disarray, and as they re-organized their command structure, now under the leadership of the famed Corran Admiral Ilmus Argo, leading the Ibyssian Brotherhood forces. They threw their might at the Sarkeen and the other Cleax, but found themselves overwhelmed. In desperation, Admiral Argo ordered all forces to concentrate their firepower on the Sarkeen, and to ignore the other Cleax forces. It was a strategy sure to cost them dearly, as the Cleax forces would be free to simply flank and open fire, but as it was the Sarkeen who had tipped the scales from imminent victory to imminent defeat, he felt the risk had to be taken. In the end, it was the Rek and the Lha Ti that saved them. The Rek, one of the Elder Races, though few in number and much-diminished as a civilization since they were nearly wiped out by the Ishvana during the War of Extinction, are immensely powerful masters of star kith. Meanwhile, the Lha Ti - the eldest of the Younger Races - were created by the Utan Mir to produce the most powerful concentration of void kith they could in a single entity. The few Lha Ti present at the Battle of the Sarkeen were among the most powerful of their race, able to survive deep space and propel themselves with void kith alone. They made directly for the Sarkeen, one of the few other races capable of surviving in hard vacuum minimal equipment, and certainly the largest they had encountered. 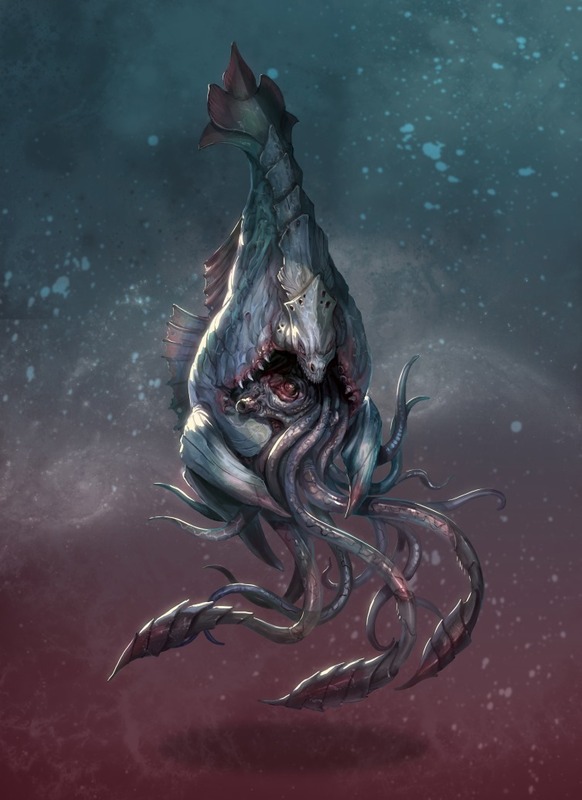 The Lha Ti themselves are enormous creatures who spend most of their time underwater where their bulk is supported, and while the Sarkeen are yet substantially larger, the Lha Ti are simply unequalled in their mastery of void kith. Just as importantly, they are biological beings, and are unaffected by the EMPs and the spore clouds the Sarkeen possess. The Lha Ti began to unleash raw void kith on the Sarkeen, trying to crush the life out of them, who retaliated with blasts of plasma, gravely burning many of the Lha Ti. Bravely, for they were in ships vulnerable to the Sarkeen, the Rek moved forward, adding the heat of the stars to the attack on the Sarkeen, shattering their bio-electric shields. On seeing their shields go down, Admiral Argo ordered the rest of the fleet, which was taking a pounding from the Cleax flanking them, to move in. Long-range railguns from the Zinari, swarms of baryon missiles from the Iron Corsairs, void bombs from the Corran and the Ixodon of the Brotherhood, and the Ait Benir's phase cannons soon competed with the spears of starfire hurled by the Rek and the crushing force of the Lha Ti. Three Sarkeen fell under this onslaught, and suddenly, entirely without precedent, they began to pull back, taking the rest of the Cleax with them. Admiral Argo ordered his forces to continue pouring fire into the retreating Sarkeen and Cleax, but not to pursue. Between losing Emperor Lin Sber'ana and the immense losses taken by the forces opposing the Cleax generally, Admiral Argo saw little gain in risking pursuit. This could be a genuine retreat, or it could simply be a trap. As was soon discovered, it wasn't a trap, but the Cleax also had not retreated very far. They appeared to be settling in, taking up residence in multiple systems in galactic southwestern Starmourn. The races of Starmourn, both those that had participate in this third fight against the Cleax, and most of those who didn't, discussed what to do. The Cleax presented a danger to everyone such as hadn't been seen since the Ishvana nearly wiped out the Elder Races ~37,000 years prior. It was decided, reluctantly, that the Cleax would have to be permitted to remain, even though they now controlled a Voidgate, potentially giving them access to those other Voidgates not protected by Aegispheres, on Starmourn's fringes. Although there were many voices who loudly counseled eradication, such as the Iron Corsairs and the Selassian Dynasty, and what was left of the United Atarsid Nation, calmer voices prevailed. It was felt by most that the problem with attempting to wipe the Cleax out was a challenge of unknown scope. None knew where the Cleax originated from, how many more there were lurking out there, and what their overall capabilities were. The decision was made to leave the Cleax to themselves, but to carefully watch the Voidgates adjacent to the now-named Cleax Gate for any signs of aggression, and for the several hundred years since then, there has been none. On the other hand, the Cleax are now present in galactic southwestern Starmourn in numbers far greater than during any of the invasions, and their potential is an issue of permanent concern among the races of Starmourn. In return, the Ishvana required the Bushraki to help it war against the races of Starmourn sector, which the Bushraki were only too happy to do, while it searched for technology to transcend and seek out the Empyreal it believes lies on the other side. Along with the Vendal, the Bushraki stormed into central Starmourn in the First Bushraki War, beginning in 18 A.E., named as such because the other races of Starmourn did not yet know that the Ishvana was the driving force behind the war. For the next 16 years, the Bushraki threw themselves with gusto into the war, but they and the Vendal were finally overmatched by the combined might of the newly-formed Song Dominion, and its hired Free Fleet, led by an aging Commander Mezer Juul and seconded by Maddox Khan and Akari Lane. Unlike those two wars, however, this time the Ishvana had recruited new allies, and unfortunately for the Ishvana, it dramatically underestimated the Bushraki's reaction to this. On the new Bushraki fleet arriving at the first battle against the Celestines and the Song, they find the Ishvana's forces consisting of the Vendal, as expected, but also its new ally, the mighty Sa'hak-ren, and their client races, the Xariel and Inorni. With time, many of the Bushraki became valued, if somewhat untrustworthy, allies with the others in Scatterhome, and inevitably, the Bushraki gave up the secrets of wetwiring and mindsim-brain integration to their allies. With Scatterhome’s somewhat anarchic nature and weak ‘border’ security, the knowledge of how to produce and integrate that tech spread to the commsphere, and from there it became common knowledge. Today, only the poorest beings don’t possess a mindsim, and most who expect to face real physical danger have wetwiring installed. Except from “An Inquiry into the Origins of the Bushraki” by Repsara Holiwee (Elgan). The Ibyssian Brotherhood - A trio of amphibious races strong in void kith. The Brotherhood is an ancient alliance of three amphibious races - the humanoid Corran, the squid-like Ixodon, and the narwhal-like Lha Ti. Their territory - which is quite large - is on the border of Starmourn sector, to the galactic east/spinwards. The youngest of the three races, the Corran, whose civilization began to take shape about 70,000 years ago, are by far the most commonly seen members of the Brotherhood outside of their borders and are believed to make up the bulk of the Brotherhood's population. Virtually all of the ambassadors and merchants among the Ibyssians are of the Corran race and many masters in the use of the voidblade are counted among the Corran. In war, their void-powered, mute shock troops are legendary. Arising as a civilization about 100,000 years ago, they are considered physically monstrous by many races and are the most alien of the three Ibyssian races. They are unisexual, reproducing via eggs that must be fertilized by three other Ixodon to be viable, and practice a form of void kith unknown outside of the Brotherhood. While the Corran live primarily above water, the Ixodon live primarily underwater, though are able to ambulate on dry land on their tentacles easily enough, at which point they're about 11 feet tall. Further, although they can tolerate pressures from the deepest depths of the oceans of their homeworld of Ylneri, they're as vulnerable to the extreme cold and vacuum of deep space as most races are. The eldest of not just the Brotherhood races, but all of the Younger Races, the Lha Ti did not evolve naturally like most of the Younger Races. Instead, they were created by the Utan Mir - the Elder race most associated with void kith - about about 3.1 million years ago. Massive, powerful, and relatively few in number, the long-lived Lha Ti generally spend their entire lives underwater, though the Ixodon do build ships containing huge tanks of seawater that Lha Ti will occasionally use if they have strong reason to leave their homeworld. Even rarer are the most powerful of the Lha Ti, whose might in void kith allows them to fly and, in the case of the mightiest of them, to even soar through the black of space. The Lha Ti were used by the Utan Mir and the Vyar to create the Void Gates about 1.1 million years ago, and proved crucial in the Battle of the Sarkeen during the Third Cleax Invasion. Though they are incredibly powerful, they gravitate towards metaphysics, mathematics, and other pursuits of the mind. The Loroi - four arms, four eyes. 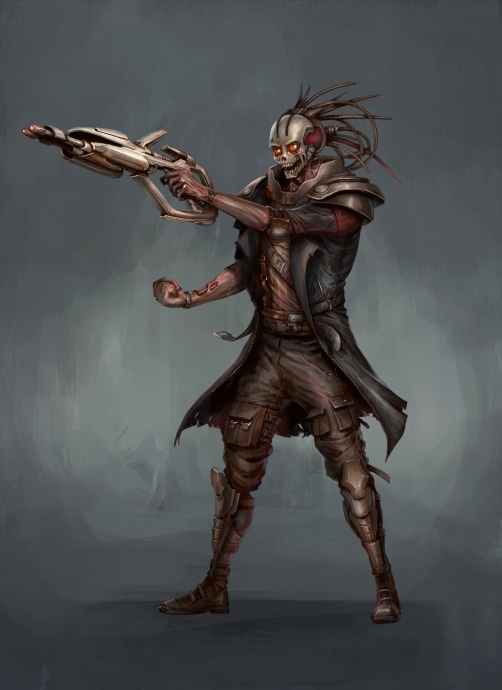 The Loroi are a highly-aggressive, four-armed and four-eyed race that was conquered by the Selassians long ago. 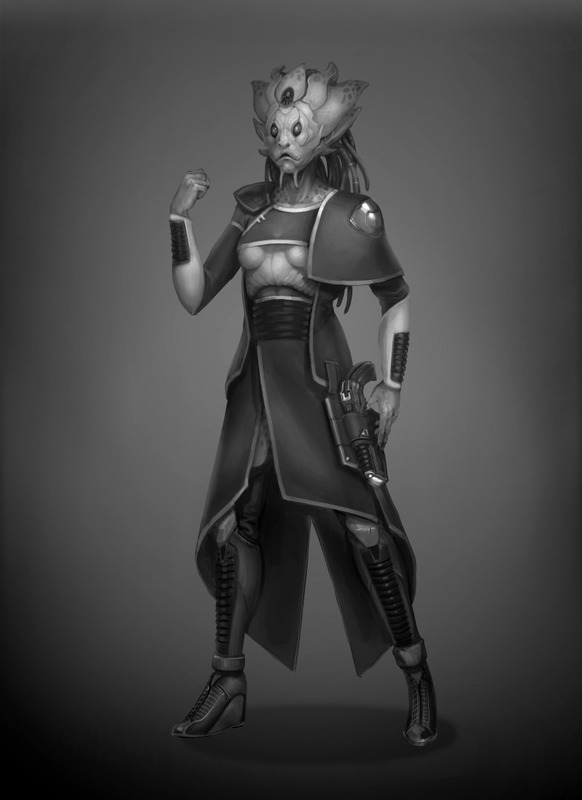 While there are pockets of independent Loroi in Starmourn, most exist as a subjugated race, though they exercise some degree of self-government, from their home planet of Kellos. However, subordinate though they are, they are much-feared by most races as shock troops, as the Loroi almost never retreat, preferring to fight to the death. The Nabia - Drug peddlers and slavers. The Nabia are one of the most universally-detested races in Starmourn. They're expert chemists, and, from their homeworld of Gallen III, manufacture many of the hard drugs that turn their victims into helpless addicts. That would be enough to earn them the ire of many races - in particular the Nath-el, whose youth are particularly susceptible to substance problems. They are not mere free-market providers of a good, either. The Nabia are known to deliberately hook whole populations on their substances by starting them off with relatively harmless, non-addictive substances and slowly peddling more and more addictive drugs to them, typically lying about their long-term effects. They view this as simply a smart way to open new markets to their products. If this wasn't enough, the Nabia are also some of the leading slaver traders in Starmourn, and are a combination of puzzled and slightly outraged when anyone dares suggest that slavery is not a civilized institution. One of the primary forces opposing the Nabia is the Elgan Underground - an organization largely of Elgan that seeks to indirectly and directly cripple the Nabia's operations. They engage in operations from propaganda that seeks to ensure all know the perfidy the Nabia engage in to tactical raids against supply ships carrying the raw materials for drug manufacture. Temereen - Performance-enhancing drug used to increase muscle mass over time. Injected. Vitalis - Performance-enhancing drug that decreases susceptibility to fatigue. Injected. Glitter - Addictive stimulant that makes you feel as if you're the smartest, most attractive, most wonderful person around. You're not, of course, which makes glitterheads somewhat intolerable to be around. Snorted. Black Nova - An addictive pleasure drug in which the first hour is black indeed. Many users report severe depression, and nearly all experience the phenomenon of "it coming out both ends". However, once the black period is over, the nova period kicks in as your pleasure centers all-but-explode with wave after wave of pleasure that lasts for a couple of hours. Injected. Whisper Dust - A combination of a hallucinogen and an addictive stimulant that amps up your aggression levels. Within minutes you're hallucinating, and half an hour later the stimulant kicks in. Dustheads are often a danger both to themselves and others, as the combination of hallucinations and aggressive energy can turn the user into a crazy psychopath for the duration. 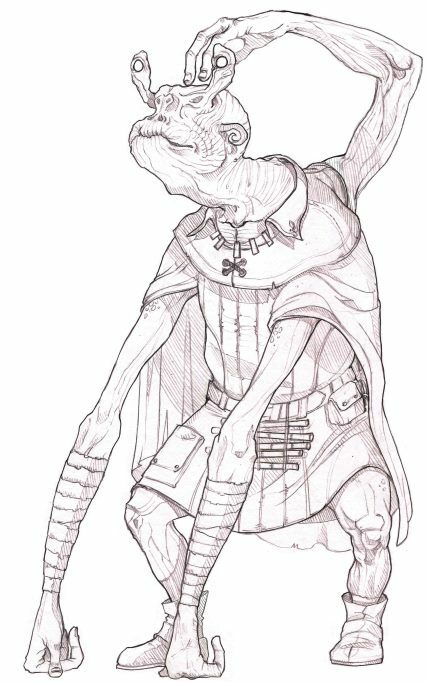 Physically, the Nabia are psuedo-humanoid, but their arms can reach the floor while standing upright. Their eyes sit on eyestalks above their head, and can be swiveled around to look behind them, which likely explains, via evolution, why they have a third arm in the middle of their upper-backs - the strangest physical thing about them. The Selassian Dynasty - Serpentine matriarchs. 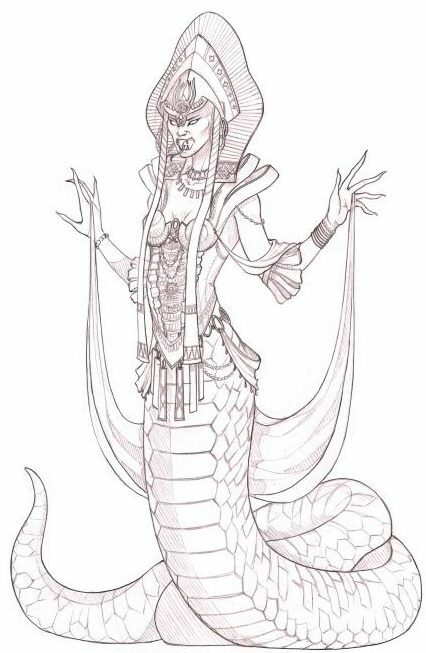 The Selassians are a strongly matriarchal race that physically looks as if a snake mated with a human. The aristocratic among the females decorate their faces with distinct black and white makeup, and favor elaborate headdresses. Male Selassians are smaller and weaker than females, and while there are exceptions, they tend to exist to serve the needs of the females. Selassians lay eggs but, when their progeny hatches, they breastfeed for the first year or so. The females reach physical maturity in about 12 years, while the males take up to 19 or 20 years to reach it. The Selassian Dynasty is a hereditary form of government, based on their racial home planet of Corryb III, with rulership passed from mother to daughter, and was established about 11,000 years ago in the wake of the War of Eggs. In this - one of the defining conflicts of Selassian civilization - one of the factions released a virus that caused infected females to lay eggs with shells far weaker than is typical, resulting in the collapse under their own weight of most eggs. With 90% of Selassian younglings perishing before making it out of the egg, the factions realized they had to come together and, after destroying they destroyed the leaders of the faction that had released the virus, the Dynasty was formed. The Dynasty is, in terms of the pure area of space it controls, the largest sovereign state in the core of Starmourn sector, though the Serene Empire of the Ait Benir contains considerably more populated worlds, as it's nearly the size of the Dynasty and is in an area of Starmourn with substantially higher system density, and both the Sa'hak-ren Empire and the Ibyssian Brotherhood, each extending past the fringes of Starmourn sector, appear to be quite a bit larger. Adjacent to the Selassian's territory are the Fatar - a loathed changeling race - coreward from the Dynasty, the Zinari Imperium to the spinward, and roughly to the lagward they abut the forbidding borders of the Y'saari Covenant - the Elder Race whose currency, the Covenant Mark, is the main currency of Starmourn. Aside from the Selassian people themselves, the Dynasty is also composed of the fierce Loroi, whom the Selassians conquered about 9,000 years ago, relatively soon after the Loroi began to reach out to neighboring stars. The Loroi are frequently used as shock troops by the Selassians, and are highly valued as such for their courage and willingness to die in battle rather than retreat. There are, however, bands of Loroi living outside of the Dynasty, typically making their living as mercenaries. The Vonikin Krel - Psychics that feed off pain. The Vonikin Krel are one of the most universally-loathed races in Starmourn sector. They’re a race of extremely wealthy degenerates who are a form of psychic vampire that get sexually excited by the suffering of their victims. Physically, they couldn’t be less humanoid. 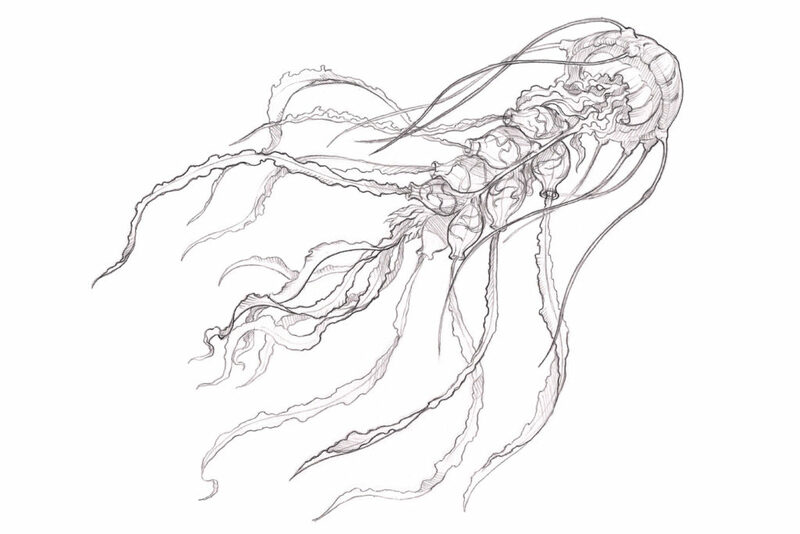 Sitting on four stubby legs, their bulbous, fleshy body has two tentacles coming out of each side, terminating in two or three mini-appendages at the ends, and two more tentacles coming out of the front of its ‘chest’, ending in vicious-looking pincers. Two vertical slits on the front of their bodies serve as eyes, while a wide mouth filled with small, sharp teeth sits underneath it. The Krel, as they’re sometimes simply referred to, are one of the few powerful species that has shown no interest in moving beyond their home system. The only known colonies they have outside of their home system of Wuntoklan – named after their home planet of the same name – are trading outposts. Like many spacefaring races, the Vonikin Krel have a long history, much of which is unknown to outsiders, not out of any particular desire to conceal it, but simply because the sheer number of civilizations and races in Starmourn, and the length of time – tens of thousands of years at minimum generally – that they’ve had a civilization dictates that there’s more history available to learn about that any 1,000 historians could master. What we do know is that they first achieved spaceflight about 39,000 years ago, as one of the first races to do so after the War of Extinction that saw the Ishvana wipe out many of the Elder Races. We also know that sometime in the past 6,000 years they became the masters of shipsim design, which marked the point at which their race came together, abandoned virtually all other enterprises, and grew collectively rich, allowing them to begin to turn their attentions to less respectable pursuits. Chief among those disreputable hobbies is the torture of sentient beings for their sexual pleasure. For thousands of years, they essentially farmed another race – the Cho-kura – that had evolved alongside them on their planet for their twisted pleasures, but by about 600 B.E. the Cho-kura were, if not quite extinct, then on the verge thereof, victims of the greed of the Krel. And so the Krel had to find new victims. As they were not a great empire, they weren’t able to themselves go out and conquer lesser species. Instead, they chose to put together a massive media outreach program pitching, unlikely though it seems with the perspective of time, incredible pleasures to be had for those who would visit Wuntoklan. They promised they could stimulate the minds of visitors such that the visitors felt they were experiencing the greatest pleasures of the mind and body possible, and indeed, they are able to do that. However, they don’t enjoy the pleasure of their victims, and so only induced that kind of reaction in enough visitors that they’d then leave Wuntoklan telling tales of the superlative delights to be found there. They were careful, and harvested only a percentage of visitors, but as with any degenerate, their appetite grew, and eventually, the official line as to why many never returned from Wuntoklan – that they simply stayed, preferring to live in ecstasy forever – began to provoke more than idle suspicion. The youth among the Der’em, in particular, seemed drawn to this lure placed by the Krel, and as the losses slowly mounted over the centuries, the Der’em, who were a brilliant, but not powerful, species began to agitate amongst other races, insisting that the Vonikin Krel must be stopped, by force. For a decade, the Vonikin Krel watched, with a level of amusement, the efforts of the Der’em to paint them as the villains they are, for a decade, but as the Decheerans, Amaians, Shen, and Tukkav began to take note, they were less amused, and decided it was time to simply silence the peaceful Der’em, using the mercenary Free Fleet, which ultimately resulted in the destruction of Earth and most of the human race, as recounted elsewhere. The Y'saari - Elder Race that controls the Mark. The Y'saari are one of the surviving Elder Races of Starmourn sector, and underpin its economy through their currency, the Covenant Mark. They are an inscrutable race of wealthy isolationists with an extremely developed and rigid sense of honesty and adherence to committments made, particularly financial ones. The Covenant is the primary institution, governmental, and cultural force of the Y'saari. It's a compact between the Y'saari, formed millions of years ago in the aftermath of the Worldbreaking, that permanently ended the economically-driven wars between factions of their race. The Covenant frames financial stability as the pinnacle of existence for the Y'saari, and everything else flows from this need. They view the exchange of value as the most sacred and important way of relating to other sentient beings. Nothing is deemed more crucial to modern Y'saari than the preservation of the Covenant and the millions of year of stability it brought them, but since the establishment of the Mark as the dominant currency in the centuries after the second Cleax invasion (3202 B.E. ), the primacy of the Mark itself is considered the ultimate expression of the Covenant. Today, the Y'saari exercise unquestioned control over many of the Voidgates in central Starmourn, with the Aegispheres looming next to each one as terrifyingly-powerful enforcers. None use the Voidgates without paying the Y'saari, and the Y'saari only accept Covenant Marks. Further, while the Aegispheres exist to protect and control the entry into and exit from Voidgates, any attempt to gain control of the area of space around a Voidgate has been met with overwhelming force by the Y'saari, whose technology is substantially more advanced than that possessed by the Younger Races. The Y'saari home space consists of multiple systems, all of which are well-protected defensive systems that poorly understood by those outside the Y'saari. The borders of their space are lined with weapons platforms capable of annihilating entire armadas, and they employ some kind of energy field that prevents unauthorized wormholes opening in their space. Beyond this, little is known about the Y'saari, for few are permitted entry, and the movements of non-Y'saari in their space are carefully monitored and controlled. Those who have had the privilege of invitation report that they were never without an Y'saari handler by their sides, who would dictate where they would go, who they would talk to, and what they would see. The Grensuhlians - a strange, deepwater race. 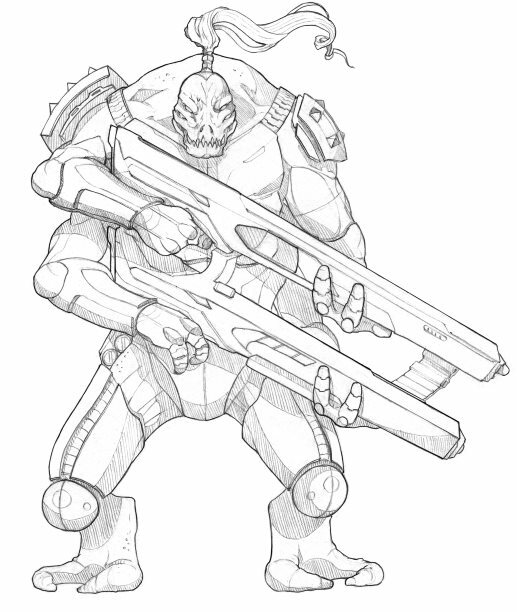 The Grensuhlians are a race of deep-water isolationists who are about as non-humanoid as is possible. The Grensuhlian 'individuals' are referred to as 'clusters' because each cluster is really made up of much smaller, simpler creatures that range from dozens to hundreds based on age. These more basic creatures spawn asexually over time using some kind of coordinated multi-cellular division, and the older the Grensuhlian, the more of them will compose the larger individual's body. However, in the case of serious illness or starvation, the Grensuhlian cluster may actually shrink, as the creatures that make it up consume each other to stay alive. The Grensuhlians are powerful telepaths and neither use nor hear sound, though they can detect atmospheric vibrations in a cruder way, much like we might feel deep, bass-y sounds. The more clusters that make up a Grensuhlian, the stronger its telepathic ability and the greater its intelligence - which is often profound. The ancients among the Grensuhlians are renowned for their capability in performing the most complex mathematics known to the Younger Races. It is, however, very difficult to secure their help. The Grensuhlians virtually never permit aliens to visit their homeworld of Odysseus, primarily because they are extraordinarily sensitive to foreign biological or chemical contamination. The deep seas maintain a very constant environment, and the Grensuhlians do not deal with inconstancy well. Further, if one of their species leave the planet, as a few have, they are never permitted to return home. Nobody's ever made money on off-planet destination resorts for Grensuhlians! Beyond this, very little is known about this strange race.